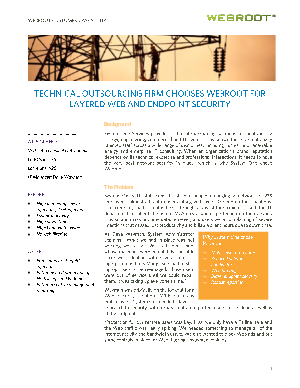 This case study describes how a technical services firm benefited from deploying Webroot for layered Web and endpoint security. The IT organization at System One services consists of four people supporting 225 employees and 20 remote office locations. Through a divestiture the company had inherited endpoint security from McAfee. As a result of inadequate protection, employees were reporting severe infections. These infections not only hit productivity, but billable hours had fallen due to downtime, which included having to ship laptops back from remote locations for re-imaging. Another problem was bandwidth usage: A spike in Web ads had strained the company's one and only T1 line. Since deploying better layered protection using Webroot security for Web and endpoints, the company has not experienced a single persistent infection. Plus, the IT manager now gets daily and weekly reports on bandwidth usage to keep apprised of Internet usage and demands on the network.